It is interesting to note the changes made to both the title of the fundraiser and its aims over several days. Click each link to see full size. From what we gather from posts seen, and since deleted from the No To Dog Meat Facebook page, many people started to query the whereabouts of the funds due to only a few transfers being made. Amounts sent to Mrs Yang vary wildly, anywhere from £3000 – £12,000. Delays, incorrect banking details and so on being the cause of confusion. 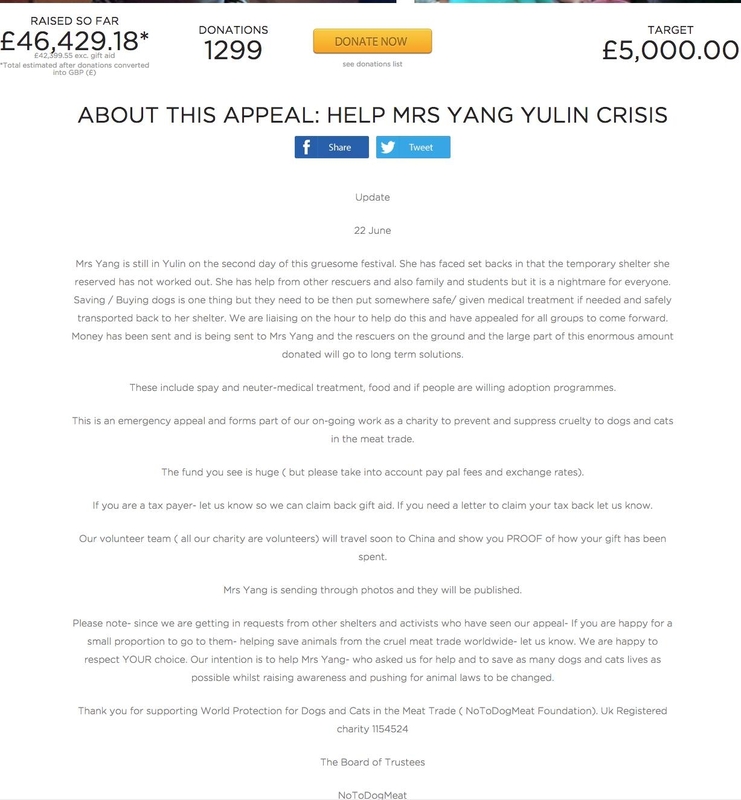 The Mrs Yang Official page eventually confirmed that approx £12,000 had been received in total. 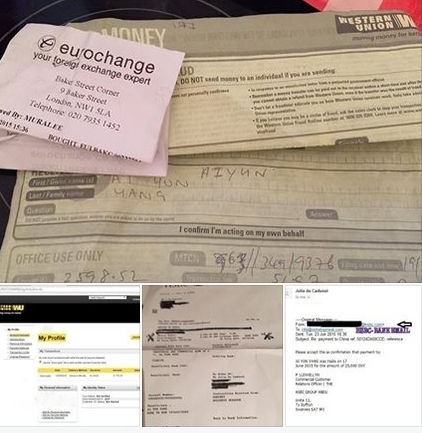 Proof of funds sent by No To Dog Meat – but not proof of funds received by Mrs Yang. 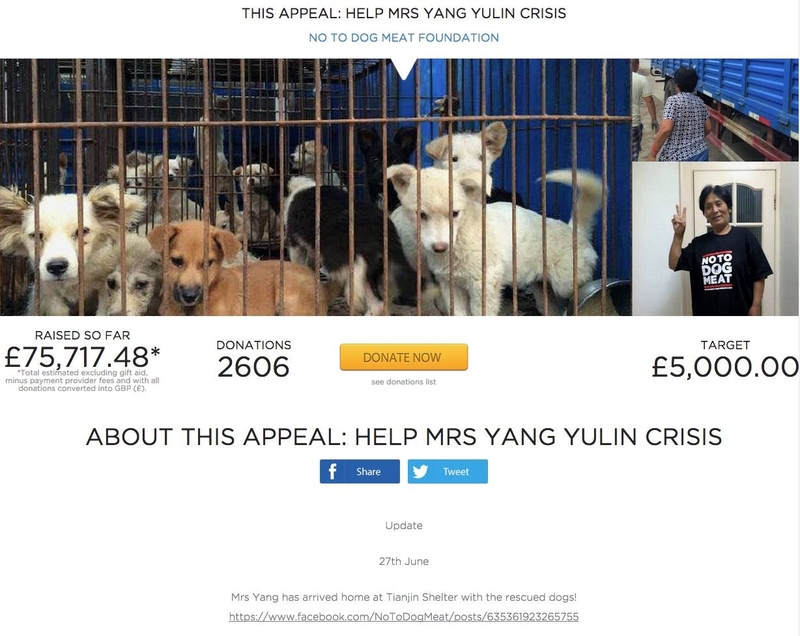 Because the fund had amassed so much money, donors were asked if they would ‘mind’ some of the funds could go to other Chinese activists on the ground in Yulin as it was mentioned that others there had seen how much had been raised for Mrs Yang and were contacting the charity for requests. (Again not an official statement, but posted on the Facebook page). While some donors were fine with this idea, many others were not as they had donated solely for Mrs Yang. One would expect a registered charity to be well aware of the following rules. Restricted income funds are funds which are often created by charitable trusts whereby the purposes are specified by that trust. The purpose will either be specified by the donor in a specific letter or the terms of a public appeal which may have been running at the time of the donation. Do they have to be used for the specified purposes? Restricted income funds can only be used for the specific purposes for which they are given. What happens if they are used for any other purposes? If restricted income funds are used by a charity for any other purposes than those which were originally specified then this could amount to fraud or deception. 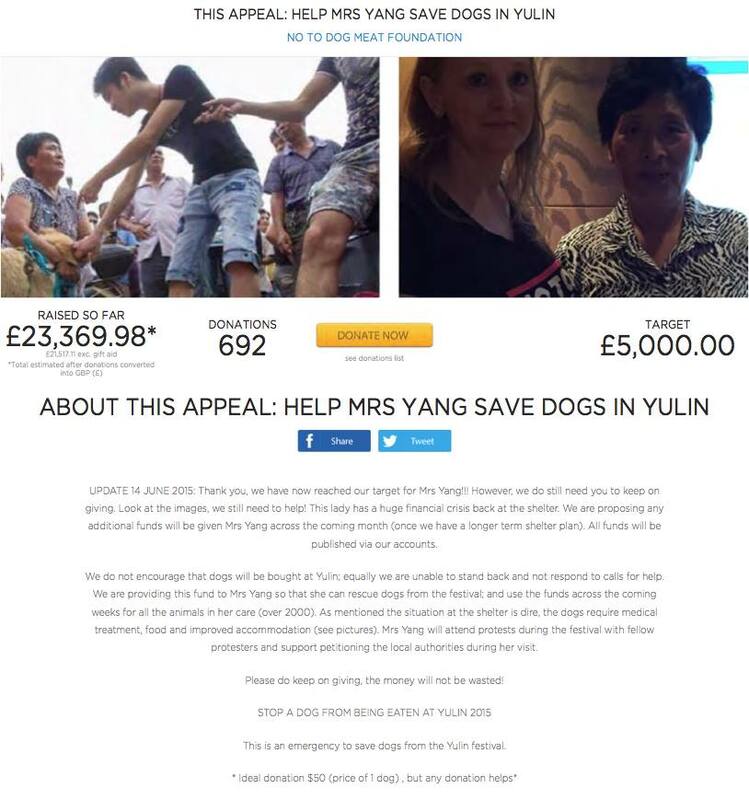 Surely if the Charity wanted to send funds to other activists in Yulin then they could have used their General Fund? Their Facebook pages and Website have ‘donate’ buttons that do not state any specific recipients – people have surely been using these for the last few years to donate to this charity prior to the “Mrs Yang” fundraiser?. As we mentioned, there were many questions asked regarding the funds, predominantly on June 23rd however one particular thread was removed altogether, as can be seen here in this screen shot. (Names redacted for privacy even though the page is a public one). Over 200 comments deleted according to the screen shot below. While there are also many posts on the page referring to ‘trolls’ and ‘hate campaigns’, if that were the reason the thread was removed, surely it would have furthered those claims to let it remain there for all to see? Just another observation. In July 2015 a petition emerged online at Care2 Petitions. We the undersigned call upon the recipients of this petition to launch independent investigations into the behaviour, actions, and financial accounts of the charity, in particular but not exclusive to the donations it has received via various means from the public for Mrs Xiaoyun Yang of the ‘Common Home’ dog and cat rescue in Tianjin, China. We petition for full transparency and that all donations are tallied and passed on to Mrs Yang without further delay, let, or hindrance by the charity. Originally this petition aimed to get 1,000 signatures, but as of writing, it is almost at 4,000 (the current target). It appears word is spreading that there is something not quite as transparent about this whole situation as one might be led to believe. **At time of publishing it seems this petition is still growing. On August 24th, the statement below was posted on the No To Dog Meat Blog. We have posted the statement directly from the official blog page and our collective questions have been inserted in red. This post, shown in the screen shot below, made by the CEO and posted on their Facebook Page on August 20th states that only the Trustees are able to make official statements regarding the Charity and that the Facebook Page volunteers and supporters are not. That would include the admins too? So none of the comments or posts on these pages are official unless stated by the Trustees? Not an altogether clear and concise way to run a social media page. These pages are purely for awareness and comments made * even with our campaign logo do not reflect our views and position unless specifically stated. So while the following update appears on the official blog, and shared to the Facebook page, because it is not actually signed by the Trustees is it official? Just an observation. Our Chinese volunteer Natalie reached out to rescuer Mrs Yang who has been widely reported in the news and in May she met our UK volunteer in Shanghai. We were sad to learn that for over 20 years Mrs Yang, a retired school teacher, had run a sanctuary without any help. She explained to our UK volunteer Sophie that not one group had supported her with funds during that whole time. As an organisation set up to help grass-roots organisations in Asia (And according to all the Facebook pages quite a few other countries.) we receive many requests for help (From whom?) and we had set aside modest funds (Set aside from where?) to distribute during the trip to China. (How much, who had it and who got it?) 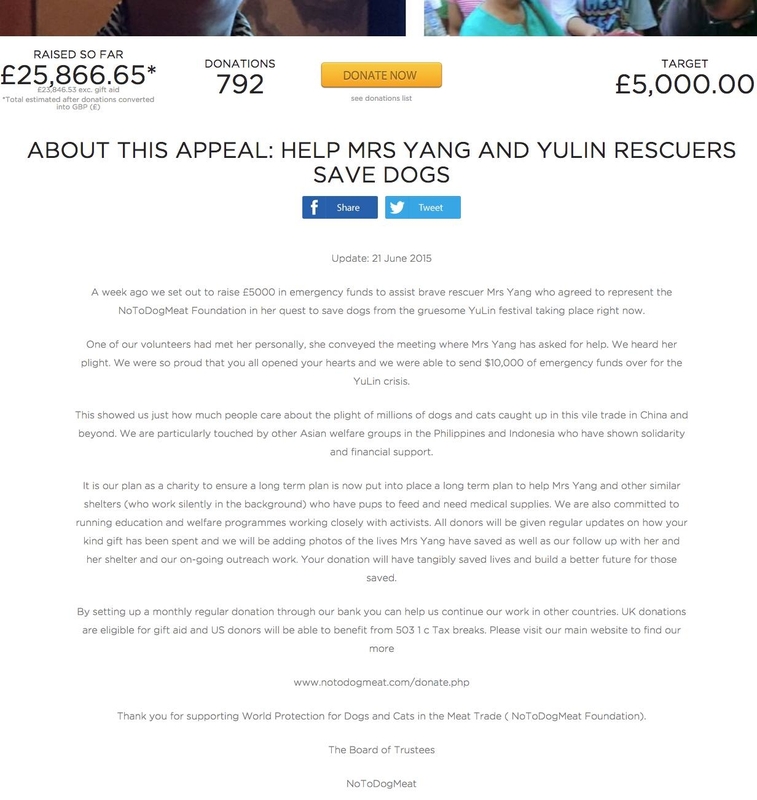 When Mrs Yang told us her plight and how all the dogs in her shelter were starving we immediately gave her a grant from this fund. (Roughly $500 in May? ) She told us this money would feed the dogs on basic supplies for an entire month. Given the unexpected size of the fund raised and the unconfirmed status of banking facilities available in the proposed recipient’s country we sought advice from the Charity Commission regarding transfer and dispersal of the funds to ensure it meets the charity and fund’s objectives. (Why didn’t you have this outlined BEFORE you started fundraising – seeing as you’ve been at the charity game for three years, right?) At the time of Yulin there had been uncertainty over the safe collection of the transfers that were sent and of the reliability of bank details and these aspects legally demanded of us increased diligence and caution with regards to sending further amounts. (Again, if you are intending to fund raise for someone, surely you should have all the bank details in place) We informed the Charity Commission of the money already sent to Mrs Yang (to date it is over 20% of the total raised) (Nobody is quite sure how much she got from your charity – crumpled up receipts etc – and your fundraiser appears to be ongoing – but the figured bandied about is around £12,000.) the method of sending, and set down with them a timetable of action for safe completion of this project . This included establishing satisfactory banking facilities in China which would allow Mrs Yang and other agreed associates (And they are?) to access funds and give us complete confidence that funds will be ultimately used for the purpose intended – helping the dogs. (If you felt concerned the money would not be used for the dogs, why fundraise? Again due diligence by your charity should have been undertaken) The Charity Commission advised us that in order to safeguard dispersal of donations and ensure the intended usage at least two further visits and inspections by us to Mrs Yang’s shelter would be advisable – one this year and one next year. Our charity WPDCMT (NoToDogMeat Foundation) aims one day to be able to pay staff to work on it’s projects full-time but, to date, no-one directly involved has ever received any wages, fees for work or payment for time (other than outside agencies such as our phone-paging service). (That’s because your HQ is a virtual office, not an actual full time dedicated charity office) This includes the CEO and founder Julia de Cadenet who has worked tirelessly and at great personal expense. (Shame she hasn’t found the time to update the WPDCMT FB page – even though it’s on social media it still represents the charity one would think, or actually respond to so many people who are unhappy with they way they have been treated. You do realise most overseas donors are not going to call the UK – it would probably cost more than they donated and others have either had no reply to emails, or very vague responses.) Despite the success of the recent fundraiser this has remained the case. In times of crisis, WPDCMT/NoToDogMeat Foundation is mandated by our legal charity objectives (https://notodogmeat.wordpress.com/our-charity/) to facilitate emergency food rations and medical treatment in shelters. (What shelters are they?) In the long term, our hope is to help Mrs Yang create a new safe shelter for the dogs (Long term? So what’s this fundraiser going to be used for if not as stated to provide a shelter? ) and for that we will really need the further help of our supporters. (You already have 75K, plus gift aid – less some funds already disbursed.) 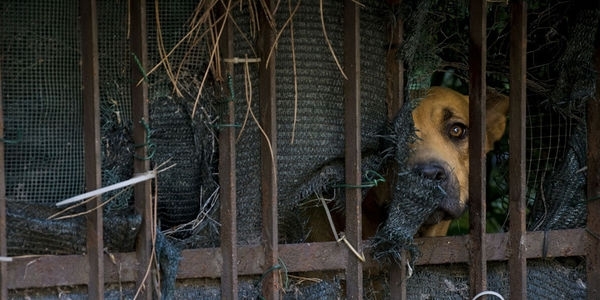 We are deeply encouraged that since Yulin many other rescues have taken place – including the ‘#707’ dog truck rescue in Tianjin, the home city of Mrs Yang (who was once again on the scene to help). (Yes, but not because of your charity – she has been doing this for decades) There are many rescuers all over China just like Mrs Yang and this gives us great hope that Asia is changing. 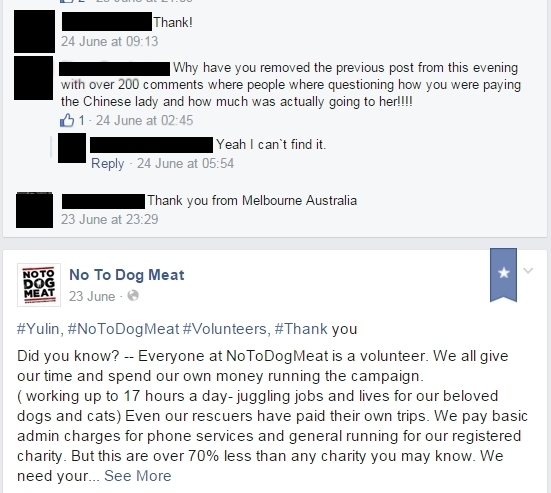 As of August 25th, a post appeared on Twitter stating that in fact a No To Dog Meat team were actually now on the ground in China, but was removed sometime later. Charities rely on transparency and having excellent communication with their donors. The issue with this charity seems to be lack of both. 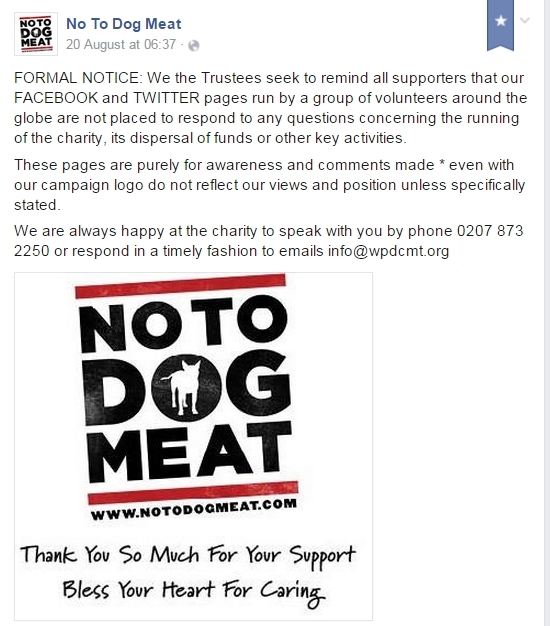 Even though the No To Dog Meat Facebook page states in it’s about page that it is ‘Official’, several posts by the Trustees have stated that any opinions expressed by the admins or volunteers do not reflect those of the charity, and that the public should contact the charity directly via email, letter or phone, to discuss any concerns they might have. All of this could have easily been avoided if the “Official” pages were run by those with the authority to pass on factual and relevant information to appease donor concerns. We look forward to observing this charity and its plans for Mrs Yang in the coming months.